10% off all 5 day trail riding holidays in May 2019! At Hallagenna Riding we offer several Trails suitable for the more experienced rider, which can be combined into a riding holiday from 2 to 7 days. 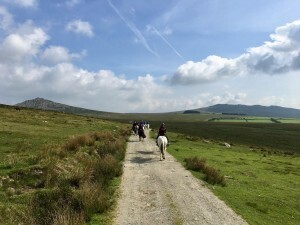 These trails last between 3 and 8 hours, uncovering areas of Bodmin Moor which are undiscovered by most people as they are inaccessible by vehicle. During these trails you will ride through terrain which is often only accessible on horseback. 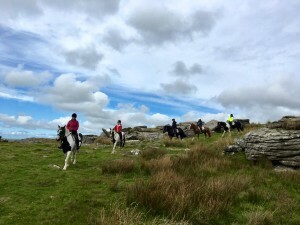 Due to its personal characteristics which sets Bodmin Moor apart from anywhere in the UK, we insist that all riders wanting to take part in a Trail from Hallagenna first complete an assessment ride. This ensures that we select the right trail and right horse for you. During the trails you will visit areas which were used by smugglers and travellers as far back as the Bronze age when settlements were dotted around the Moors. Today this beautiful unspoilt corner of North Cornwall and many of its settlements are still obvious and often used for filming period dramas such as the recent Jamaica Inn and the forthcoming Poldark, not to mention “Doc Martin”. You can choose to stay in one of our lovely cottages at the stables on a self-catering, bed and breakfast or fully-catered basis. Alternatively, you can choose to stay elsewhere and simply come to Hallagenna to enjoy a trail ride on a daily basis. For an example of a catered trail riding week, please click here. 4 hours. Our Instructor Jen was involved in handling the horses when the BBC series was filmed around Hallagenna last summer. To celebrate the fantastic scenery featured throughout the series we’ve launched a brand new Poldark Trail. During this trail we visit several of the sites used for filming to give riders a real feel for “Poldark” country. This trail will only be available to Experienced Riders (riders comfortable at walk, trot and canter). 6 – 7 hours. Our newest horse riding trail taking you on across open moorland with breath taking views of Rough Tor and the highest point in Cornwall, Brown Willy. The trail continues through the vast open moorland commons of Davidstow and West Moor into Altarnun Parish. On the outskirts of the parish lies the Rising Sun Inn, a welcoming 16th century pub serving excellent food and real ales. 7 – 8 hours. 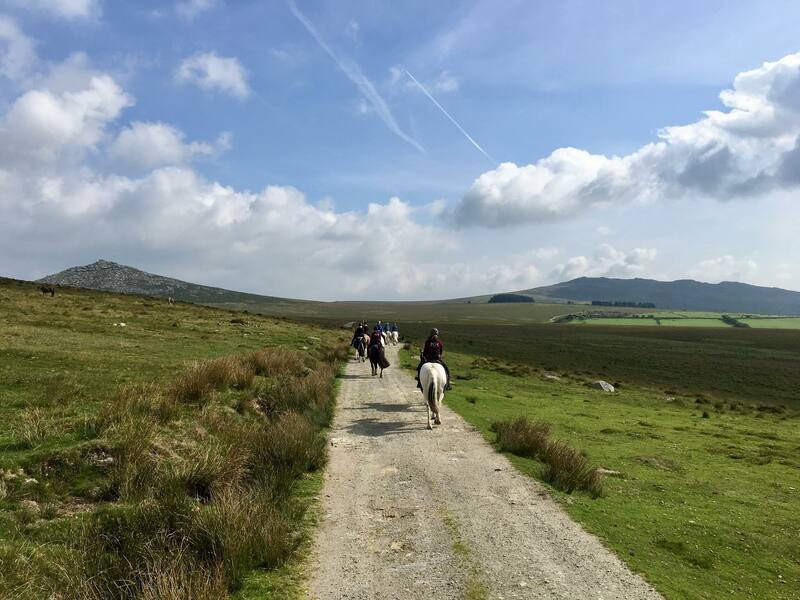 Our newest trail takes in some of the wildest scenery on Bodmin Moor, which again featured as a stunning backdrop to the Poldark series. This trail lasts 7 – 8 hours, at times following some of the old smuggler’s routes across the Moor until we reach the infamous Jamaica Inn, high on the Moor. We stop there for a refreshing lunch whilst our horses relax in their own paddock. Riders can choose from the newly-refurbished Inn’s extensive menu (extra cost) before saddling up to commence the ride back to Hallagenna. of the moors, and on to a delightful village green where you can enjoy some light refreshment or lunch. where we stop for some well needed light refreshment – a Cornish pasty Lunch or Traditional cream tea. 3 hours Riding on Open Moorland taking in breathtaking views of the whole of Cornwall and the Atlantic Coast. can have a really good Gallop. On to pretty Blisland village and its welcoming pub for Lunch or just a refreshment break. We are constantly trying new trail rides. Please ask us to put you on our trail rides list to receive updates of new trails and rides available. We also hold specific trail riding weeks during the year – call us for more information. Please note that none of the above Trails are suitable for Novice riders.All riders who would like to take part in any of these Trails should be able to Walk, Trot, Canter and Gallop in a competent and controlled manner on horses and ponies which are suitably selected for these trails. March special offer on self-catering cottages!